Artist Robert Maplethorpe made a career of making sensual photographs. Frequently his subject was orchids. In Rex Stout’s mystery novels, the expansive detective Nero Wolfe devoted several hours each day to the care and tending of exotic orchids. For Maplethorpe, the artwork was the photograph; for the fictional character Nero Wolfe, it was the orchid. The ocean is Nature’s artwork. It provides us with a full sensory experience in 3D, total surround sound, and a varied array of olfactory and tactile delights. When we compare the experience of reading literature and poetry, listening to great music, visiting a museum, going to the theatre, opera, or ballet with the effect that the ocean has upon us, the similarities are striking. Like the best of art, the ocean is visceral, overpowering, unpredictable, soothing, unsettling, alluring, dangerous, simple, complex, mysterious, sublime, and finally, addictive. When we scan across the panorama of the ocean at sunset, or stare up at the starry sky as we listen to the sound of lapping waves, we are able to experience the awe, the grandeur, the majestic nobility of the universe. It awakens in us our deepest feelings and thoughts. It connects us to a greater unity that is both larger than ourselves, and more than the sum of its parts. Similarly, when we visit a museum, read a great book, or listen to a musical masterpiece, we experience the same wonder and awe that connects us to all things. These experiences are deeply personal; yet, like most profound involvement, they demand sharing with those close to us. My wife, Mary, and I live near the Atlantic coast in a suburb of Boston. For over thirty years, together with our two daughters, we have made a habit of vacationing in the small fishing village of North Chatham located at the tip of the ‘elbow’ on Cape Cod. The girls, now grown, continue to return, bringing their own children and friends, passing on the experience. Like most inland dwellers, when we arrive at the ocean, the first thing we notice is the smell. The smell of the ocean is like no other. It triggers our deepest memories, tracing our evolutionary past back to our watery beginnings. The bond between ocean and human is wide and deep. The ocean, surrounded by Vermeerian light, pounds us with its rhythms; it soothes us with fragrant melodies and picturesque harmonies, focusing our senses against a repetitive background of wind and waves. We are walking on the sand at lighthouse beach on a warm, sunny day in July. As we turn the corner tracing our footsteps along the shore, leaving the lighthouse behind, we approach South Beach, a nine-mile narrow stretch of Atlantic coastline. The only things visible for miles are ocean, sand, patches of beach grass, shore birds, a few resident seals – their heads bobbing up and down in the coastal waters, and an occasional beach hiker. Looking outward, Portugal and the European continent are directly across the ocean, due east. Nantucket and Martha’s Vineyard are hugging the coast to the south in the direction of our walk. We often walk on South Beach early in the morning where we have the shore mostly to ourselves. We have walked on this Beach many times, and conditions have never once been the same. Every high tide and low tide is unique. Some days it is cool and windy. Other days the air is foggy enough that we can’t see two feet in front of us. Today it is low tide; the air is clear, and it is sunny and hot, but breezy. The waves are calm. It is perfectly pleasant. We walk out onto a small sand bar and watch the waves interact with one another as they dissipate against the shallow bottom. As the waves approach us, they criss-cross one another without losing their individual form or definition. Each wave is independent, yet relies on the support of those around it. These separate, intersecting waves remind us that we are both individuals and social creatures. The water-land boundary, where the ocean meets the shore, symbolizes the place where our marine ancestors first pushed up onto land. 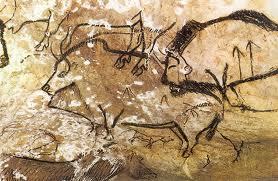 It represents the beginning of the evolutionary climb toward self-consciousness, language, and art. For billions of years, creatures lived mostly in water. In 2004, a team of paleontologists discovered a fossil they later named Tiktaalik from the Inuit. This primitive fish lived at the time of the water-land transition, an intermediate creature located at the boundary between fish and land animals. The Tiktaalik had scales and fins like a fish, but also had a head free of its shoulders. This fish had wrists, ribs, ears, and other parts of its skeleton similar to land animals and mammals, including humans. All of these human features can be traced back to fish of this kind. After walking for some time, we require rest. Sitting on the sand together, watching the waves roll in, suggests a kind of spiritual meditation. It is also a commanding multimedia event: the breaking surf, the spray of saltwater against the skin, the pungent, sweet-smelling mist, the powerful and rhythmic sound of crashing waves against the sand, combine to form a stunning sensory, almost religious, experience. Most of us are attracted to the power of ocean waves. Waves are fundamental motions. Microcosmic vibrations create energy and matter in the universe. Light and sound are waves of energy that enable us to see and hear. Brain waves control our every thought, feeling, and action, including our unconscious mind and dream states. Everything ultimately begins and ends as a wave action. For some, it may be a surprise to learn that earthquakes, hurricanes, cyclones, tidal waves, mountain waves, solar waves, the ebb and flow of tides, circadian rhythms, and other familiar wave cycles are acoustic phenomena, sound waves of different shapes and sizes, that vibrate outside of the normal range of human hearing. Ocean waves, too, are acoustic waves. We can’t hear them because our ears are not tuned to waves of this scale. Nonetheless, they exhibit all of the characteristics of normal acoustic waves, except that ocean waves are surface waves that ride along the top of the ocean, driven by wind, and by motions of the Earth, Sun, and Moon. There are also internal ocean waves that travel under the surface, caused by boundary differences in water temperature, density, and salinity. When we observe the great waves of the ocean, and are transfixed by them, we are hooked into our own biological destiny. The ocean, and its waves, subconsciously reminds us of the repeated motions of our lives, the salt water in our veins, and the fish-like creatures we once were. It is common for some to think that we may lose part of the spirit or wonder of a ‘magical’ experience by analyzing or exploring it too much. In reality, the more we understand the nature of a thing, the more it heightens our appreciation of it. The more we know and understand about the ocean, its history, influences, cycles, rhythms, and habitats, the more we value it, and the more profound our experience. The ocean awakens and keeps alive in us the sublime order and elegance of Nature. The profound experience it brings resonates with us, because we too are Nature.